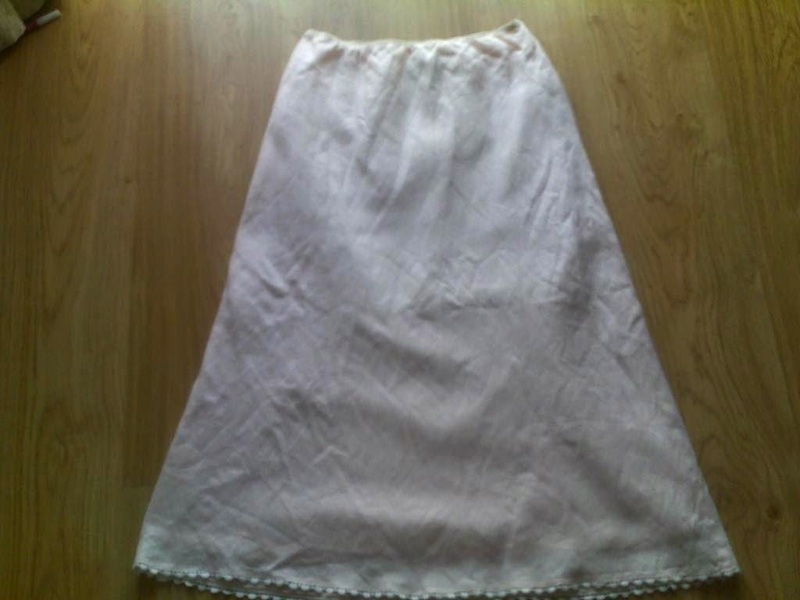 In one of my recent decluttering missions I found an old skirt (adult sized) in my craft closet. 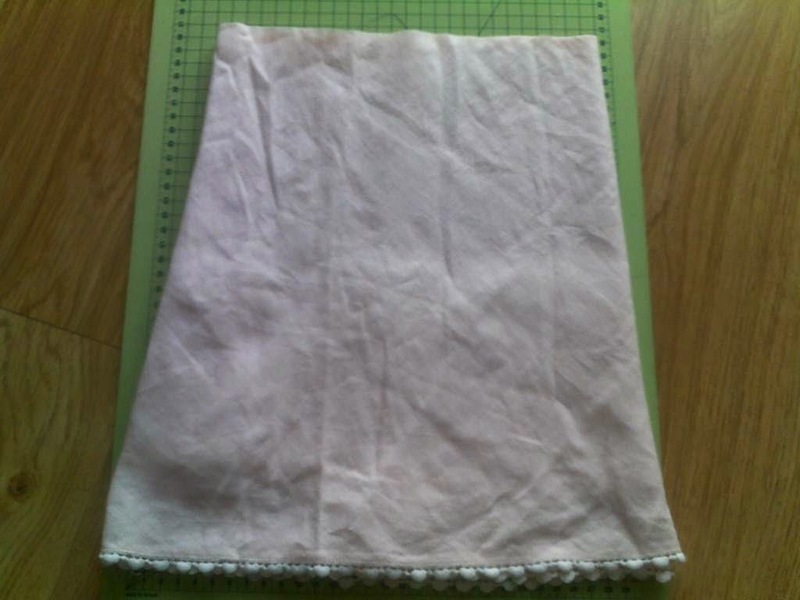 I got it (used) from a friend to whom it didn't fit anymore, but because it was a nice soft pink linen fabric, I decided to keep it. It was way too long for me and at the time (I can't remember exactly when but it must have been over a year ago) I debated several alternatives to make it shorter. The easiest way would be to use the existing waist (which was just the right size) and just cut the excess length and make a new hem. But the original hem was cute, with a heart shaped pattern I didn't want to loose since it was the eye catcher in an otherwise plain skirt. I put the skirt away for a while to think about what I wanted to do with it, then days turned into months and it never came out of the closet again. Well, lately my daughter (now four and a half) has been a lot into skirts, and with spring in full force and summer just around the corner, it seems it's just the right time to wear them. The ones she has from last year are now way too short, and even though some can be lengthened (see my tutorial on how to lengthen girl's skirts here), she needed a couple of new ones. So, why not make them? Thus, the skirt that should have been for me (though I didn't really need it and rarely use skirts anyway) ended up being turned into a skirt for her. And I did get to save the original hem! Basically, I measured the height using one skirt that fits her well now and cut the fabric leaving enough room for a new elastic casing. Then, and that was left to do was to sew said elastic casing, insert the elastic and close the opening. Even without the iron-on, this is a very good example of how sometimes looking at things in a different light allows us to find their true destination. 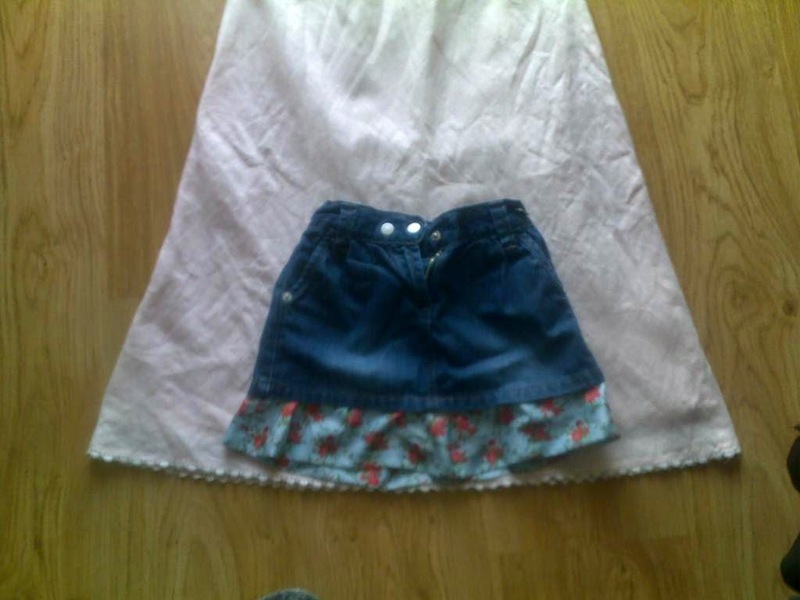 I turned a skirt that was just cluttering my closet into a perfectly functional skirt for my daughter in something like 10 minutes. I'd say its win-win all the way! ...and I have plans to upcycle it as well. I'll let you know how it goes in a couple of weeks (hopefully). So, what else do you have in your closet that could be upcycled? Thank you Jess, have a great week! What a cute and nicely done idea! I love that little skirt and I look forward to seeing what you will do with the top part of the old skirt! I usually don't up-cycle that much, but I do sew and DIY! Hi Teresa,my Mum is a brilliant seamstress, but it never rubbed off on me or my sister. She was always making clothes and altering things and I'm sure I still have the pin marks to show for it! The bunny skirt you made for your daughter is not only clever, but really cute too! My grandma was very talented and my mom inherited her talent and made me a lot of clothes when I was growing up. I'll never be as talented as they were/are, I don't have enough time to learn/practice, but I do love creating new things. Thank you for stopping by! Well, that's one I've never tried. But I've seen around (I don't remember where but I must have it bookmarked somewhere) an idea to turn a man's shirt into a girl's skirt and that's something I want to try some day! Great save! 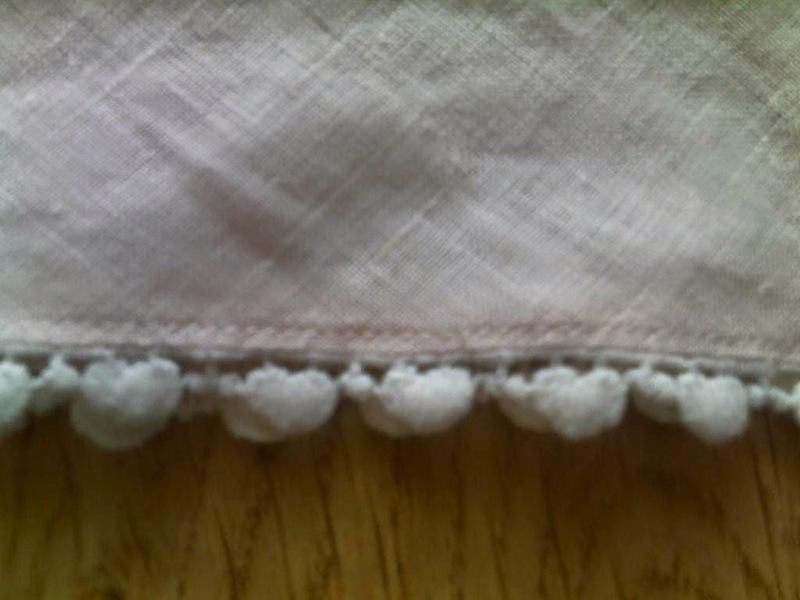 I love the trim on the hem too. Great save of the trim! and the total job is great. I once took a velvet and lace adult dress from the thrift store, and made my 2 little girls each a dress. They were 1 and 3 at the time. I'm not an expert seamstress, so dresses are a bit too complicated for me, but skirts are easy, especially if they come half made like this one! Thank you for stopping by! 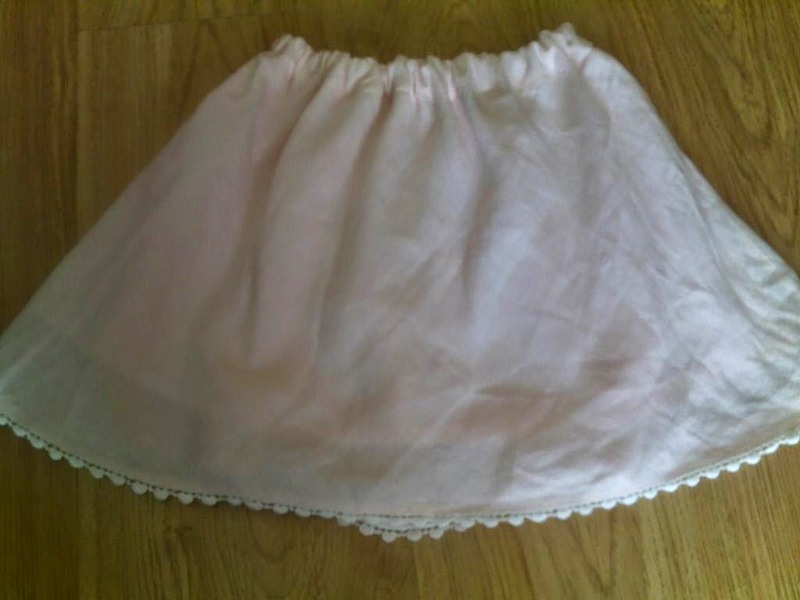 That is so cute; I have a son so never got to make pretty things like that for him, but this week I altered a friend's dress in to a skirt for her... love adapting clothes rather than chucking them out! Great idea for reusing! Thanks for sharing on Motivational Monday. Hope you will link up again tomorrow night! So cute! I bet she loves it. Thanks for sharing with SYC. She does love it! Thank you for stopping by! Super cute!! 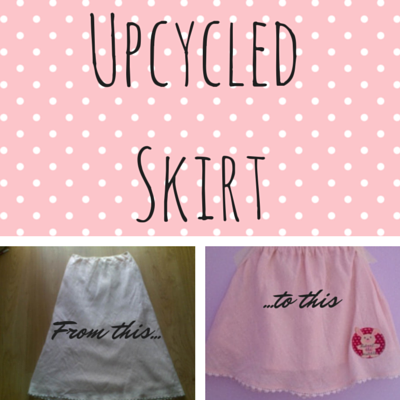 I love to upcycle!! Thanks for sharing on My 2 Favorite Things on Thursday!! Hope to see you again tomorrow!! Love your stuff!! Pinned! Thank you Elaine, I've already linked up to this week's party!